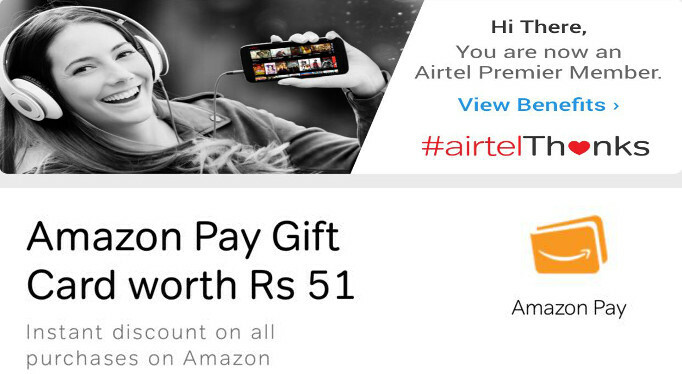 Airtel today announced that it is offering free Amazon Pay digital Gift Card worth Rs. 51 to its pre-paid and post-paid customers as a part of its 23rd anniversary celebrations. Our heartfelt thanks to our customers for partnering with us in this 23 year journey to make us India’s leading smartphone network. We are delighted to partner with Amazon Pay in this celebration with our customers. Online shopping is very popular among customers with smartphones. With great data experience on India’s fastest network, our customers can now enjoy added value of recharges and bill payments along with shopping on a wide range of offerings/deals from Amazon.